The United States Agency for International Development has donated 3,274 tablet computers to the Department of Education (DepEd) in Bohol as part of the national government and USAID’s Basa Pilipinas initiative. 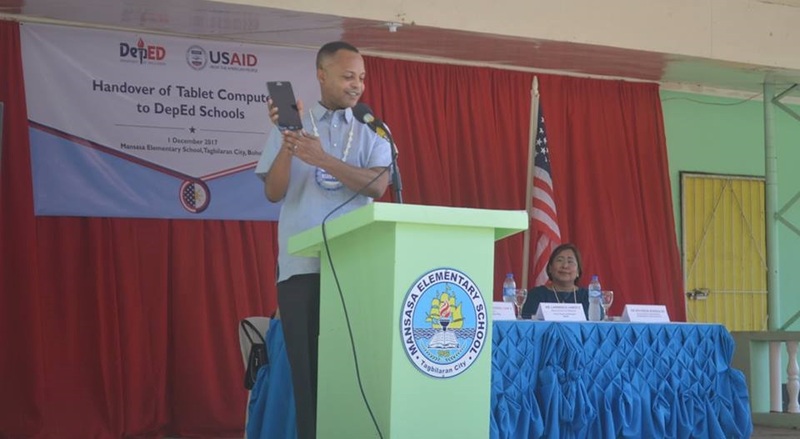 USAID Mission Director for the Philippines, Mongolia and Pacific Islands Lawrence Hardy II led the official ceremonial handover of the tablet computers at the Mansasa Elementary School in Tagbilaran City on Friday morning. The devices have been installed with a classroom observation tool called Standard Classroom Observation Protocol for Educators for Literacy (SCOPEL). SCOPEL includes digitized teaching methods which would also assist head teachers in providing instructional support. The tablet computers were also designed to lessen the burden of teachers in bringing materials such as lesson plans as these are already included in the devices. After the turnover ceremony, Hardy explained to school teachers how the tablet-based applications work. He also watched a demonstration of teaching methods used by the school and joined a reading session with third grade pupils. According to Hardy, the devices will boost learning capabilities of early grade pupils and also teach them basic usage of technology. The Basa Pilipinas initiative is the flagship basic education project of USAID in support of the national government’s early grade reading program.